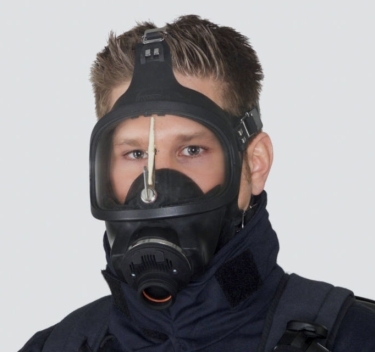 MSA Safety has more than 100 years of experience, reliability and competence in the field of breathing apparatus and Personal Protective Equipment. This has paid off and made it possible for MSA to develop the AirElite 4h. MSA has successfully applied the principles of oxygen generation from potassium hyperoxide (KO2) for breathing air regeneration for more than 40 years now. The AirElite 4h is the state of the art successor to the AirElite 2h, which was developed in the year 1995. This was the first long duration device using the KO2 technology exclusively in the market. Together with its integrated control monitor the IC-Air it forms a unique closed-circuit breathing apparatus. All the benefits of the KO2 principle are now available for a long service periods of up to four hours. Developed for all practical purpose in cooperation with the accreditation testing body DEKRA EXAM Ltd. and customers all over the world, the unanimous needs of fire brigades and mine rescue teams were analyzed and taken into consideration. Its main applications is by far for fire brigades at tunnels, chemical plants (like refineries), large storage facilities and high-rise buildings. Exclusively for mine rescue teams we offer the well-established KO2 technology for their long duration underground and rescue missions. The absolute safety and comfort of the user were the primary factors in the development of the AirElite 4h. A sleek and slim design, the breathing tubes are by its side and close to the body for maximum freedom of movement, unhindered and extremely easy for breathing. This by far makes the AirElite 4h an indispensable piece of operational equipment. The operations and the oxygen generation is breath controlled and they do not need any more than the user's exhalation. We have ensured the maximum level of safety possible and attained the same. The air supplied to the AirElite is dry air and the user experiences comfortable breathing. Inexpensive and economical on the pocket it is but an added advantage. There are several easy options available in regard with the training of the user in the donning and doffing. MSA also offers KO2 training kit for the most demanding training scenarios at fire schools and mine rescue training galleries. AirElite 4h does not require any additional logistics such as expensive testing equipment, oxygen transfer pumps or deep freezers. Compressed oxygen and ice candle logistics are not necessary; this reduces the investment and maintenance costs of the AirElite 4h to a minimum.